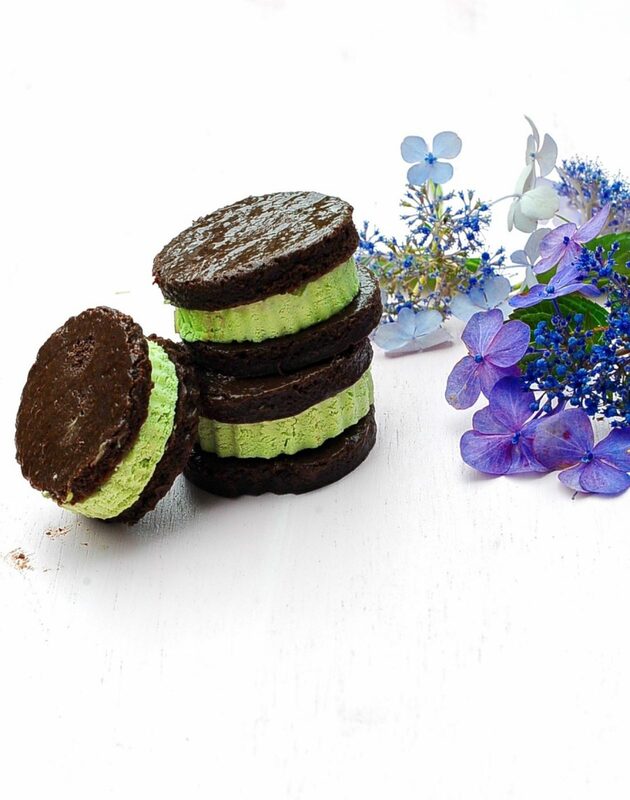 Matcha and mint are a match made in heaven, or should I say a Matcha made in heaven. 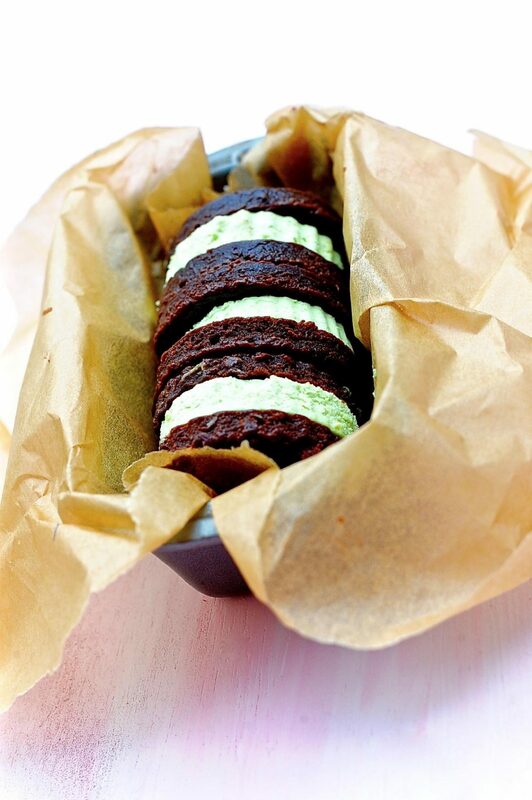 Imagine a creamy, minty ice-cream disk sandwiched between two thin brownie like cake layers. 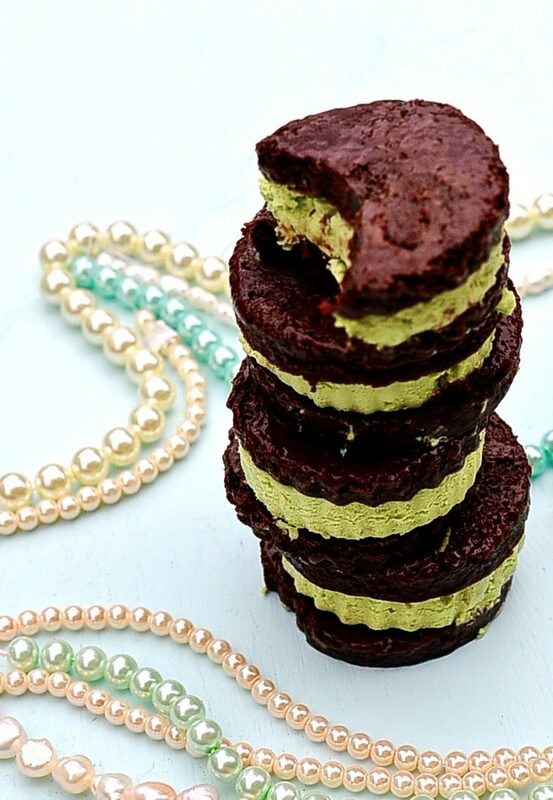 A chocolate, mint, Matcha, brownie party in your mouth. I have barely gotten anything done since I made these yummy sandwiches. Last Saturday I came home with an abundant farmer’s market haul. Feeling all hip and Martha Stewarty I set out to make a bright and seasonal gaspacho. Ten minutes later I was sitting in the garden eating an ice cream sandwich, well more like three ice cream sandwiches and had forgotten about my plans for soup. So heed my warning: Do not attempt to make these, I beg you. 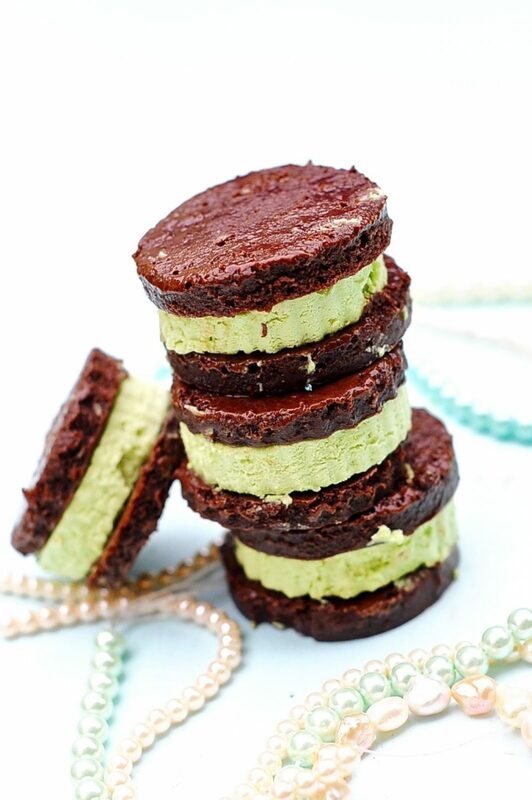 Abandon productiveness all Ye who eat these Matcha Mint Ice Cream Sandwiches, they sure are Divine. And so a star was born. What ever happened to Dennis the Editor I wonder. 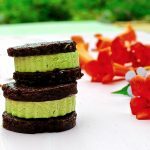 Gloriously creamy Matcha Mint ice cream sandwiched between two thin brownie-like cake layers. Place your coconut milk into a medium sauce pan with your split vanilla bean and corn starch. Stir it over medium heat until the mixture just comes to a boil and remove immediately from the heat and whisk in the Matcha. 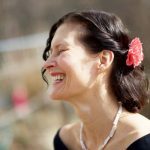 Into a high speed blender (like a Vitamix) place your drained soaked cashews, your steeped vanilla bean, coconut milk, brown sugar, peppermint extract and salt. Blend 1 minute on medium speed, scrape down the sides and blend again until perfectly smooth and not at all gritty. Allow to cool. Once your ice cream base is perfectly cooled it is time to make the aquafaba whip. Place the 1/3 cup aquafaba into a spotlessly clean mixer bowl with your cream of tartar. Whip on high (5-15 minutes) until stiff peaks form. Begin adding the sugar a spoonful at a time whipping between additions until you have added all of the sugar. Fold the ice cream base gently into the aquafaba until fully incorporated. Heat your oven to 325 Fahrenheit. Place your dry ingredients into a large bowl and stir to combine. Okay 5 minutes have passed, add the rest of your wet ingredients to the bowl with your soy milk, including your aquafaba. Whisk your wet ingredients for 1 minute until just frothy. Pour your wet ingredients into the dry and stir or whisk to combine. Do not over mix. Line a 9X13 pan with parchment and pour in your batter. Gently smooth and place in oven. Bake for around 20 minutes. Until the top is not sticky to the touch. These are beautiful! Did you use a scalloped cookie cutter to cut out the ice cream? 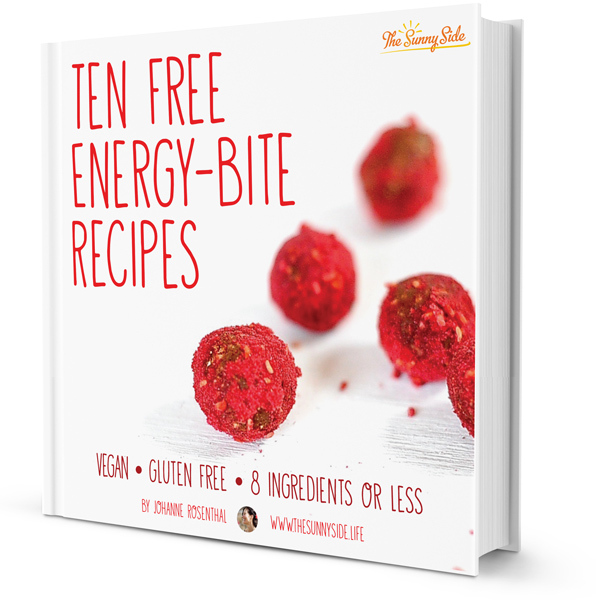 Any suggestions for a gluten free flour to substitute? Thanks! Yes I used a graduated set of biscuit cutters that I borrowed from my daughter. I haven’t tried with gluten free flour yet. There is a great FB group called gluten free aquafaba and they might have an idea of the best substitution. If you try please let me know.